Calving occurs when a colossal chunk of ice breaks off a thick ice shelf to become an iceberg. This natural phenomenon occurs in both polar regions, but is most awesome on Antarctica. My map below pinpoints one of the foremost iceberg calving regions. However, the spectacle occurs along many Antarctica coasts. Iceberg calving is more intense in the Antarctic than in the Artic because its ice shelves (see photo) are significantly higher. 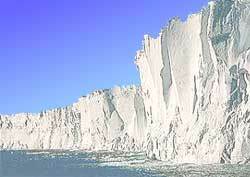 Some Antarctica ice shelves rise 300 meters (1000 feet) above the water. A calving iceberg is spectacular to see but can be dangerous because its creates a mini tsunami that's capable of capsizing a nearby boat. There's seldom any warning. When you here the telltale cracking sound, the nascent iceberg has already begun to break off the glacier's face.